"My Dad, Donnie Robertson, far left back row would have been ten years old here. Anyone recognise themselves or a parent?" My uncle, Dod McLeman is standing on the right. Aunt Jean said her sister, Barbara, is also in the picture. I wonder if she is sitting, next to Dod? Standing, at the other end of that row, is Ian Maclemman, of Navity. His family emigrated to Australia and Ian died there. Back Row - From left 1st D. Robertson, 3rd Donald Matheson & 4th Walter Davidson. 2nd Row from Back - From left 4th Mona McKenzie, 5th Rosie Hendry & far right Eleanor Ritchie. 3rd Row from Back - From left 4th Cathie Watson, 8th May Grant & far right George Mcleman. Front Row - 2nd from right Derek Matheson. My late Father George Shepherd is 4th from the right in the front row, wearing a long tie. 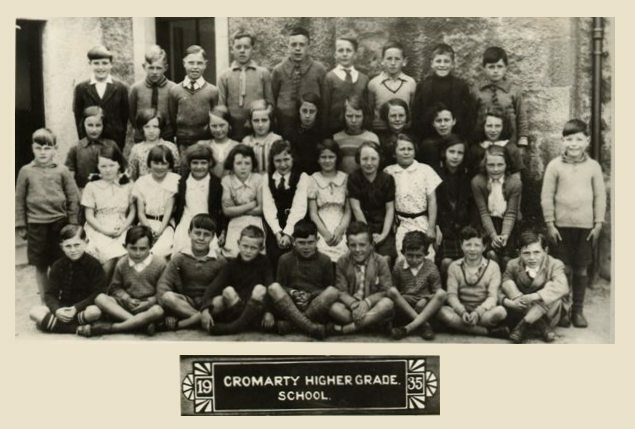 If anybody has any information about Walter Davidson as shown on photo fourth left back row please put comments on site or email as we are putting together a family tree and visited Cromarty last year to trace my farther's ancesstors. My father Walter Davidson was born in Cromarty in 1923. My late mam May Grant is 5th along from the left 2nd row from the front. Who is the young lad sitting in the front row left with a beautifully parted hairdo. We wondered if it was Alfie Skinner who was at school at this time with his friend George Shepherd and May Grant. I think my late Aunt, Moira Duff, is the fifth girl in from the right in the second row from the front. She married James Urquhart and lived in Dingwall. She died in 2016, aged 90. If this is who I think it is, it’s Elna Ritchie in the second row from back on the right hand side, not Eleanor. Elna is short for Helena. Elna was my mother’s cousin. My mother Lilias (Bunty) Watt lived in Crieff and was Robert and Agnes Ritchie’s granddaughter. She used to holiday in Cromarty as a child.